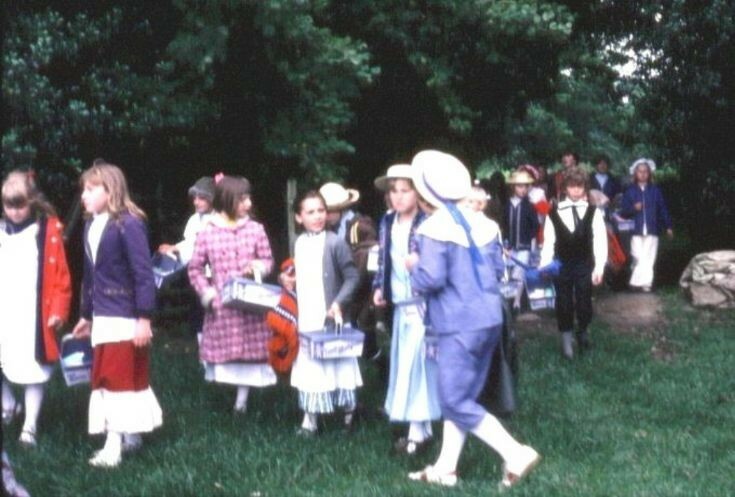 On 5th June 1978 one of the final events in the programme celebrating the centenary of Handcross School was a picnic with the staff and pupils dressed in period clothing. I do not know the location but the above shows the pupils arriving at the site and the Large Version shows the picnic in full swing. Select Open Document to view the end of the Thanksgiving Service held at All Saints Church on 30th June 1978. A video of the pupils arriving at the church can be viewed at picture #771. The Rev. David Towne is seen saying goodbye to Sister Sue Aylmer. On the left is Jack Parker from Pease Pottage, former Vice Chairman of Slaugham Parish Council. The little girl in front of Sister Aylmer is Nicola Terehe, granddaughter of Helen and Sid Beard. The picnic was held in the field next to the stables in The Hyde (the stables close to the entrance to Desmond’s Castle). My mum made old-fashioned ginger beer for the occasion and we had pony rides on Star, a pony belonging to John and Brenda Shirley.